3 How To Get Rs 10 Amazon Gift Voucher From Yippee? Hu Guys, This time we are back with Yippee maalmaal Offer where On buying of Rs 10 Yippee Pack You will Get Rs.10 Amazon Gift Voucher Free. It means 100% Cash back. Yes Guys This is a great offer to earn unlimited amazon gift vouchers almost free. It cost you nothing because on Rs 10 purchase you will return get Rs 10 gift voucher. 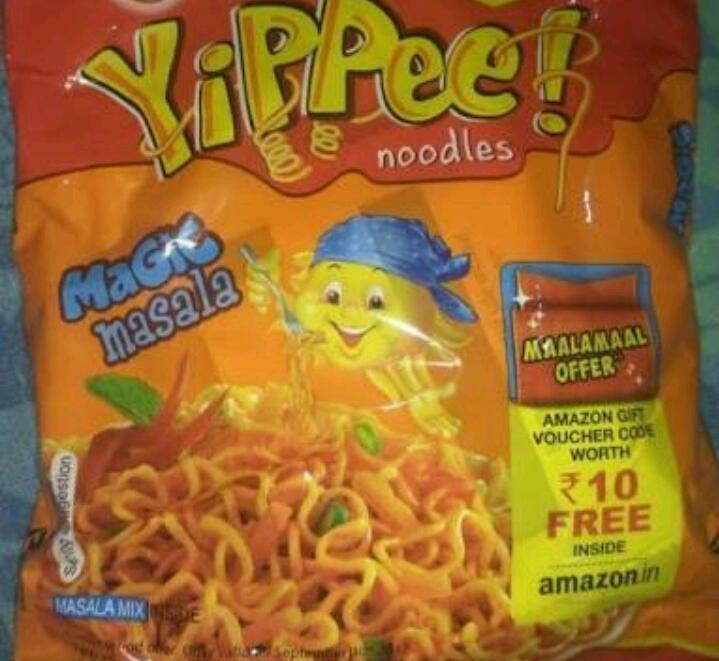 Today I bought almost 10 Packets of Yippee Noodles at Rs 100 and Get all Rs 100 in the terms of Amazon Gift vouchers which I am Utilizing in Amazon Great Indian Sale. Previously there are lots of cash back offer running By paytm like Bingo Mad angles, Closeup etc. Now this time fill your Amazon pay balance with this exciting offer. Now follow the below instructions to grab the offer! How To Get Rs 10 Amazon Gift Voucher From Yippee? 1. Firstly Go to your Nearest Store and ask about Yippee Noodles. 2. Check the packet where Amazon maalmaal offer Logo printed or not. 3. If Logo is there simply Buy as many packet You want Because all your Money going to return . 4. Now Simply Consume Yippee or Open the packet and Find Yippee Masala pack. 5. On Yippee Masala Pack You will See Your Amazon Voucher Code . 6. Now Go to Amazon Gift card page. 7. Now simply enter Your code and Click to add Button. 8. Voila ! Rs 10 Amazon Voucher is added in your amazon account. ▪ You will get Rs 10 worth Amazon Gift Voucher on each pack. ▪ The Yippee Noodles pack worth is Rs 10. ▪ Rs 10 amazon voucher added as a Pay balance in your amazon account. ▪ Each code is unique, and you can use it only once. ▪ The Pay Balance will expire in 1 year.